Bitcoin.vn Review 2019 – Scam or Not? Bitcoin.vn is one of the pioneering websites that geared towards cryptocurrency in Vietnam. The website up to this date has been providing services all throughout the region and today we will be reviewing the website for you. Join us as we look into their website features, explore their deposit and withdrawal methods and just simply get a general idea of what their services are! Without further delay, let’s talk about that! As mentioned, the website is based in Vietnam and offers BTC exchange services. The website was launched in 2013 and almost 5 years later, they are still providing services through the country. Reading through their company background, we discovered that the company Bitcoin.vn is also behind the website Vbtc.vn (which we had a hard time creating an account with) a digital asset trading platform. Their headquarters is located in Phuong 8, Quan 4, Thanh pho, Ho Chi Minh, Vietnam; with the business license number 0312584713. Now that we’ve talked about their background a little bit, why not try our luck with their verification process? Why did we say “try our luck”? If you are familiar with region-based exchange websites you would know that getting an account is as close as impossible due to the restrictions and requirements (local mobile phone number) in order to get your account verified. To create an account with Bitcoin.vn, we first need to go to their website and click on their Register button which can be accessed through this link. 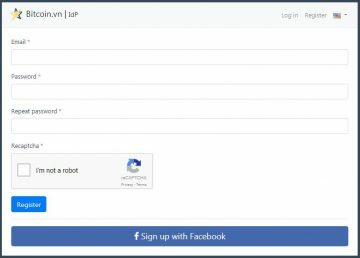 The registration tab will ask for your active email address, the password for the new account and click on the CAPTCHA code provided and you’re all good! Or you can connect your social media account (Facebook) and breeze through the registration process. Once the user has been created successfully, an activation link will be sent to the provided email address. This is why it is really important to have an active email address or this exact reason. If you are not from Vietnam, there is a huge change that your confirmation email will land in the Spam folder since the email is in a different language. Copy the provided link to your search bar to finish the registration process. Congratulations! You now have an account with Bitcoin.vn. Now let’s talk about verification tiers. Compared to other websites that we have reviewed (region-based) you are unable to do anything, yes, literally anything if your account is not verified at least once. Here at Bitcoin.vn, that’s changed because we are able to trade even with Tier 0 accounts! Tier 1 – A tier one account can exchange up to VND 200,000,000 per month and 50,000,000 per order. To have your account up to the 1st tier, you need to provide your full name, passport or ID number and a photo of yourself holding the provided identification. Tier 2 – The limit for a Tier 2 account has significantly increased to VND 800,000,000 per month and 200,000,000 per order. Tier 3 – The final tier is corporate partners and handpicked account holders that are high volume traders. These are the elite traders of the website and does not have any limits with a much lower fee compared to regular tiered customers. To read more about the verification tiers, please click this link. Now let’s move on and look into what features they have for their users. One of the features that this website has its ability to translate from Vietnamese to English, let’s not forget about that. If you are familiar with region-based exchanges, having a translated website is sometimes overlooked but is not properly recognized. 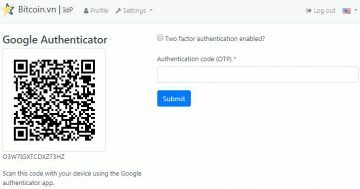 In addition, the website offers 2FA for its users which is always welcome when it comes to the security of our accounts. They also have an affiliate program that a registered user should take advantage of! Each time your recruited user makes a trade; your account will get 10% revenue of each trade! Here’s what you’ve all been waiting for, trading with Bitcoin.vn! It’s actually pretty simple and it would not take much of your time. Just simply click on either Buy or Sell tab and choose from BTC, BCH, and LTC! The only payment method accepted in Bitcoin.vn is through wire transfer and no other payment options are available. This might be since we do not have a verified account, but if you guys have one with them, please do let us know if we are right or wrong with the “one payment” method. On the right-hand side of the exchange page, the breakdown of the order is shown. Here you will be provided the processing fee per currency along with the exchange fee. Compared to other exchange websites today, Bitcoin.vn charges a huge 2.5% exchange fee per transaction! That is more than 100% expensive than most of the existing websites today. The only reason why we see people creating an account with them is due to the deposit options that this website offers for locals in Vietnam. You might be wondering earlier on what banks they accept deposits from, right? Well, they accept deposits from Vietcombank and Vietnam Export-Import Bank District 4. To read more about their deposit options, please click this link. Withdrawals are done on the same page where you purchase or sell your crypto from. For payout banks they accept ACB, AgriBank, BIDV, GPBank, and HSBC, just to name a few! To get the list of the complete withdrawal options, please create an account on the website. The website has an email support channel wherein customers that have issues with them can contact the provided email at support@bitcoin.vn or use the ticketing system on their website. Their physical address was already mentioned earlier in this review for issues that require immediate attention. The website is pretty solid for an exchange that is focused on the Vietnamese region alone. If you are looking for an exchange that is fast and has a lot of local bank options, then Bitcoin.vn is the website for you! The only issue we saw was the fact that they have a crazy expensive fee for their exchange. If you have a verified account on the website, please let us know your experiences in the comment section below. This entry should be updated. First of all, the Vietnamese government has seized the domain, so the exchange is operating under bitcoinvn.io now. They also added a few more cryptocurrencies and lowered the fees.